I’m back! The beach was good (well, as good as it could get for me). Being bedridden with a view of the Atlantic tide rising and falling every day isn’t too bad. Watching flocks of pelicans congregate, honk their voices out, and skim for fish isn’t too bad. Having six good friends rally for your health isn’t too bad either. And thankfully I am feeling a lot better. My posts should be a bit more regular now that my appetite is back and my throat doesn’t object to solid food! I actually made this recipe awhile ago, but it’s never too late to post. I’m blessed with the Your Dekalb Farmers Market which flies in goodies from all across the globe, so Chinese long beans are usually at my disposal. When I saw Smitten Kitchen’s Green Bean & Cherry Tomato Salad, I knew I had to make it. Besides, it’s so much fun when non-vegan bloggers make delicious vegan food. Of course I didn’t have all the right ingredients, but basalmic vinegar is delish (as I’m sure red wine vinegar is). Instead of regular green beans, I used the long beans, but cut them in half in order to fit them in my pot. I also used grape tomatoes instead of cherry tomatoes–again, this doesn’t seem like much of a stretch. My friend David was wigging out over finals a few weeks ago (he graduated this semester) and scared to death that he wouldn’t pass a class and actually graduate, so he practically locked himself in the library for a week to study for finals and write papers. While I was supposed to be writing papers, feeding poor freaking out college students is way more fun. In order to make a meal out of the salad, I heated up some left over couscous, layered the green bean salad on top, added some fried tofu, and drizzled the extra vinaigrette on top. He thought it was so good that he told me to teach him how to make it before he moved to New York City. Unfortunately, David is en route to the city right now to start his new life as a paralegal at the District Attorney’s Family Violence Unit (sounds like a cheery job, right? ), and I never taught him how to make it. At least I can send him the link, right? So here you go David–make this with the fresh veggies I know you’ll buy at the Union Square Green Market. And yes, I’m living vicariously through you. Cut off the tips of the beans, cut in half, and parboil them in salted water until tender (4-5 minutes). Drain and immediately spread them out on a towel to cool. For the vinaigrette, peel and dice the shallot fine and put it in a bowl with the vinegar and salt and pepper. Whisk in the olive oil. Taste and adjust the balance with more vinegar, oil, or slat, as needed. Toss the cherry tomatoes in with the vinaigrette; this can sit for a while. 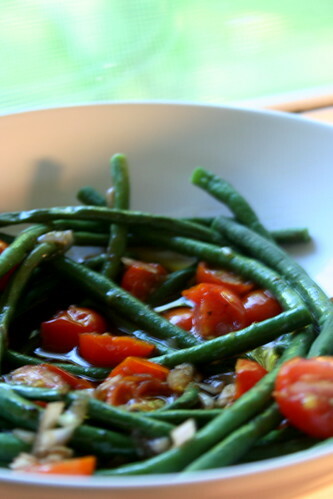 Do not add the green beans until just before serving or they will discolor from the acid in the vinaigrette. So glad to read that you’re feeling better, and that visiting the beach helped with your recovery. Keep getting better, please!! :0)Mmm, what a great salad!! I love the combination of beans & tomatoes. Yay to feeling better and having awesome, relaxing vacations! !I’m going to have to search for long beans at the Farmers Market this week when I go; that salad looks fantastic and the recipe sounds so simple!FYI: The Bird Sanctuary is in Druid Hills – I posted the Google map link in my comments to reply to yours, but should have posted it here! I love Smitten Kitchen’s salads! I saw that recipe and was intrigued, but I couldn’t see it being a meal… couscous and tofu would make it so perfect, you should send that recipe straight to David so he can make vegan awesomeness whenever he wants and hopefully keep nourished during his new job. Ouch, what a job… also, I’m glad you’re feeling better!